Hiruma is developped as a non-canon Japanese concept for a sportman hero. As usually Japanese sportmanship underlines the idea of effort, Hiruma's only concerned about winning and is focused on the idea that "If they don't win the match, there is no point in it at all". For this reason he's been also referred to as a "devil-hero" (as a reference to him being a kind of "anti-hero") by Inagaki, which convinced Murata to draw him in such a way that also his look could be considered "close to being a demon". About his name: Hiruma's last name (Hiruma) is spelled with a kanji litterarly meaning "leech demon", while his first name (Youichi) is spelled with with a kanji meaning "bewitching one". If the two kanji are put together to form his last name plus first name, it can also be read as "demon in broad daylight". 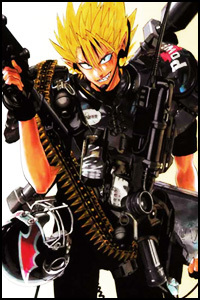 Trivias: Hiruma is one of the few non-main characters gaining the place of favourite character in his series in a poll conducted by Weekly Shonen Jump, and achiving the feat of not only placing first in a following Dream Eleven poll (in which a team was created via popularity poll of characters based on their positions), but also to be the only character receiving over twice as many votes as the second-place finisher and more votes than all the other candidates combined together.